What’s special about Malapascua? Why would you go there for diving? 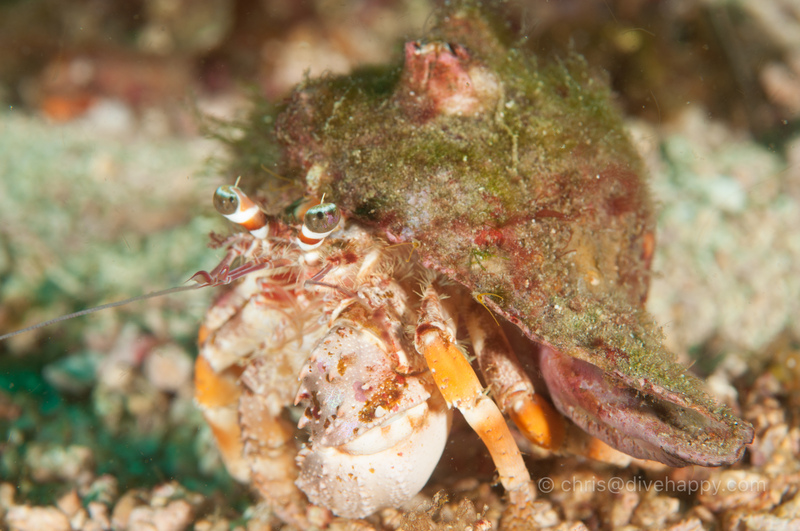 Excellent Macro – The sharks get all the headlines, but Malapascua also has excellent macro diving all around the island too, all of which is easily accessible. Between the sharks and the seahorses, there’s easily enough to see over a week long trip. What Can I Expect To See At Malapascua? Besides the thresher sharks, there is an abundance of interesting macro critters – provided you’ve got a eagle-eyed guide to find it. 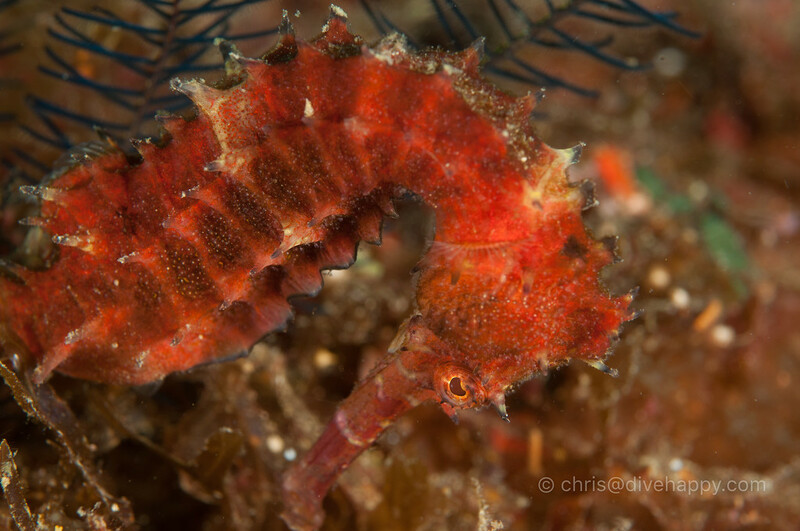 There is a huge array of seahorses – we must have seen 12 different seahorses over the course of several days macro diving, including pgymy seahorses on two occasions. The other macro classics abound too; plenty of nudibranchs of all shapes and sizes, mantis shrimp (both spearing and peacock), cuttlefish, crabs, sea snakes and turtles. A real stand out was finding a blue-ringed octopus which I definitely was not expecting. 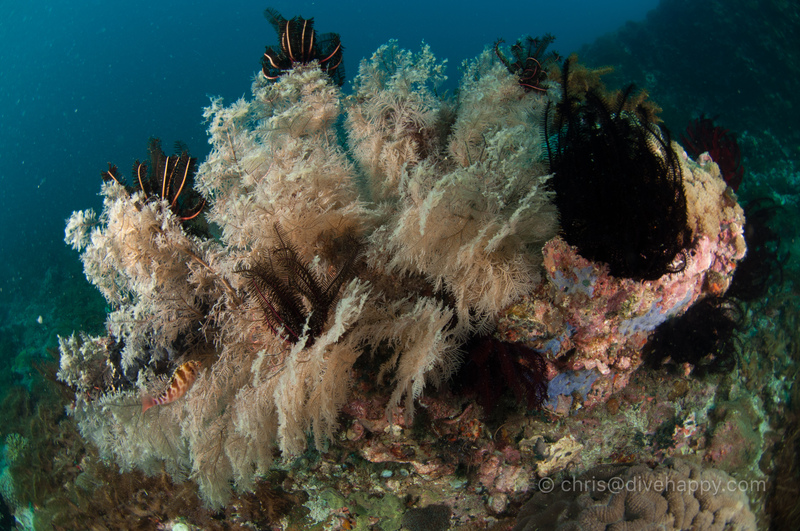 We didn’t encounter any harlequin shrimp, flamboyant cuttlefish or frogfish but they’re supposedly out there – somewhere. 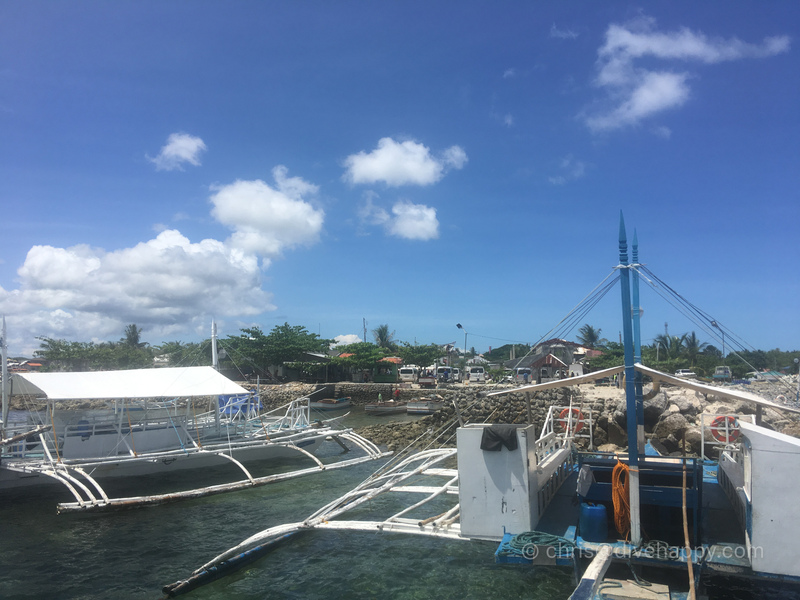 There is not much in the way of picturesque wide angle reef, except at Ubang Bato (Deep Rock) and Quilliano which both have small but concentrated patches of beautiful soft coral growth. 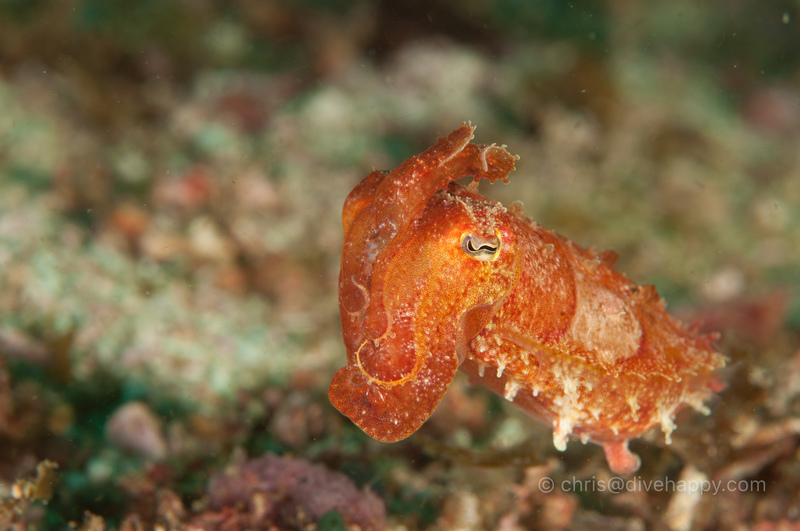 What are the stand out dive sites at Malapascua? 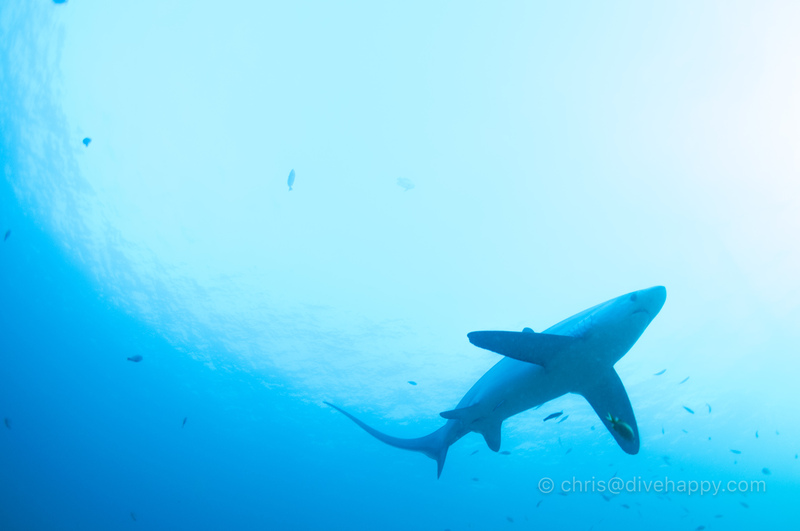 Monad Shoal – this is the iconic dive site for the thresher sharks. Topographically it’s a flat sandy bottom at 10 metres which drops off into an abyss – from which the thresher sharks rise up at first light. The 4.15 am start is not as bad as it sounds: the 45 minute boat journey begins in darkness under thousands of stars, and then the sun gradually rises over the sea as you arrive at Monad Shoal. 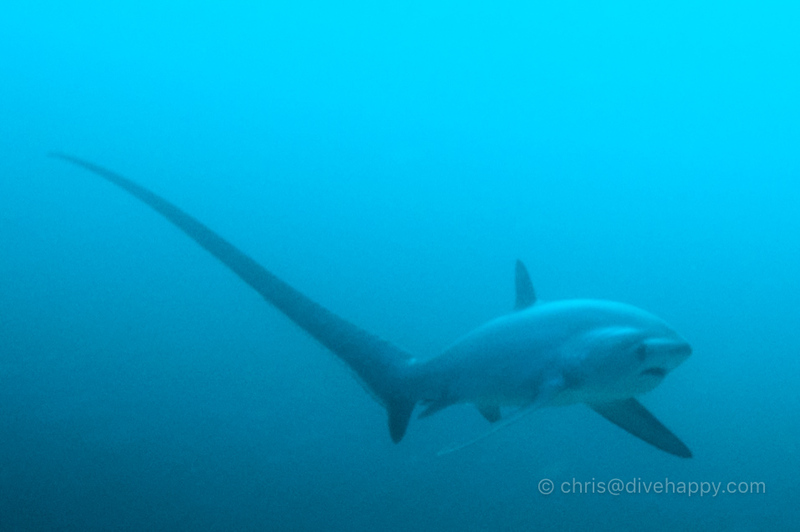 It is a pretty epic way to start the day, even more so if you get to see the thresher sharks. When it’s busy at the dive site, divers have to essentially kneel and wait at the edge of the drop to see if the sharks will come up – they are easily spooked by bubbles. However, if it’s quiet as it was when we went (only 2 or 3 groups of divers in the water, all quite spaced apart), you can simply dive back and forth along the edge of the wall and try to see the threshers in the dark blue. Sometimes you get just a glimpse of their unmistakable elongated, arched tails, sometimes it’s a flyby parallel with you… and sometimes you get lucky and they’ve gone really shallow onto the plateau and will pass over your head when you’re just under the drop-off’s edge. Macro Sites Around Malapascua – The dive sites around Malapascua island itself all kind of blur into one as great macro treasure hunts for seahorses, mantis shrimp et al, as mentioned above in the What Can I Expect To See section. We returned to North Point and Quill Wall a couple of times and they were rewarding each time. 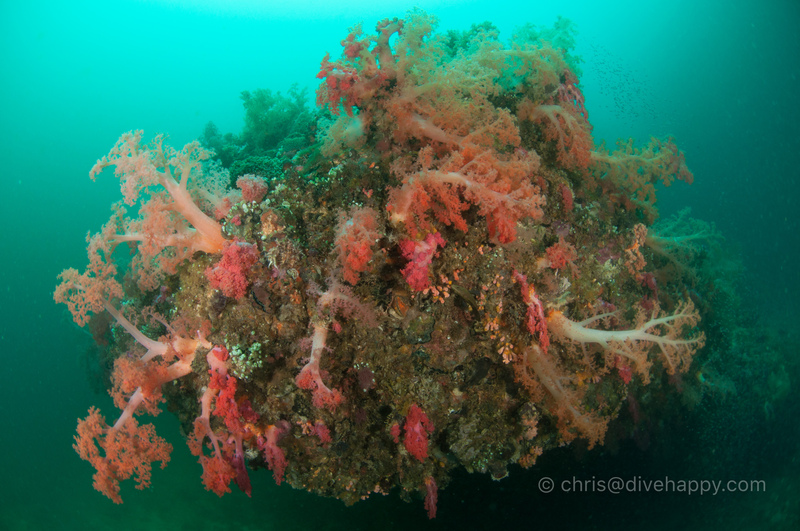 These dives are typically straight down to 20 metres and then staying there for the entire dive as it’s on the sandy bottom most of the best finds are located. Deep Rock and Quilliano have patches of lush soft coral, although the visibility was not particularly great and the water quite green when I was there. Gato island is a 45 minutes boat ride away which is promoted as the wide angle dive area of Malapascua. There’s a big swimthrough which goes right under the island, leading out onto its submerged slopes and a collection of big boulders, some covered with soft corals, which form canyons. Unfortunately the day we were here the visibility wasn’t so great and the water very green. Still, we got to see a school of fish racing in circles feeding on the nutrient-rich water, turtles and cuttlefish, along with sleeping nurse sharks in one of the swimthroughs. Chocolate island is just off the south of Malapascua which has a lot of brownish soft coral rather than the more picturesque kind beloved of photographers. 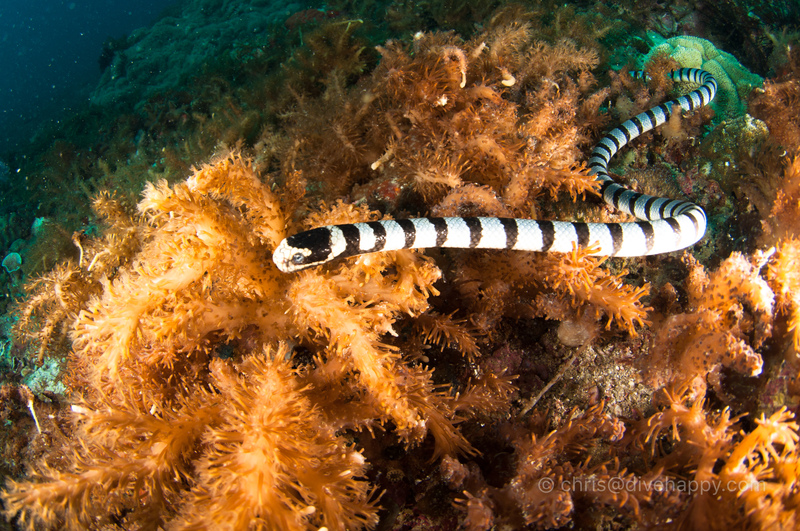 It’s definitely worth visiting as it harbours some bigger life like sea snakes and turtles. Calabanggan Island is worth mentioning as a super photogenic sandbar island which is a day trip from Malapascua. Calabanggan is considered one of the most beautiful in the Philippines – the main purpose of a visit is to take selfies and enjoy the beauty, with snorkelling and diving as an add-on rather than the main focus of the trip. When to dive Malapascua? When’s the best time of year? The island tends to get very busy during December and January – so there are a lot of divers in the water for the shark dives and so on. Be sure to book well in advance if you’re thinking of going during December and January. I went in October and it was very quiet on Malapascua even though the conditions were perfect. The water was cooler than I expected at 28 degrees. There was some thunderstorms and rain in the afternoons and evenings – the usual short and intense tropical downpours – but it had no impact on the diving (or our enjoyment). Typhoon season is the same as hot season – June to September. This is simply something to bear in mind and shouldn’t put you off planning a trip during this time, unless you are a super rigid schedule. Malapascua was badly damaged back in 20I3 by Typhoon Hainan, although to look at the island now you wouldn’t even know. What’s the water temperature like at Malapascua? The water temperature was a bracing 27 to 28 degrees when I was there in October. It’s likely to warmer in summer (June to September). A 3 millimetre wetsuit with rash guard was adequate. A hood is advised if you feel the cold easily. Gloves are allowed around Malapascua but not on the thresher shark dives. I stayed at Kokays Maldito resort which is at the southern end of Logon Beach. It’s a super convenient location – the boat from Maya Port pulls up almost directly in front of the resort. 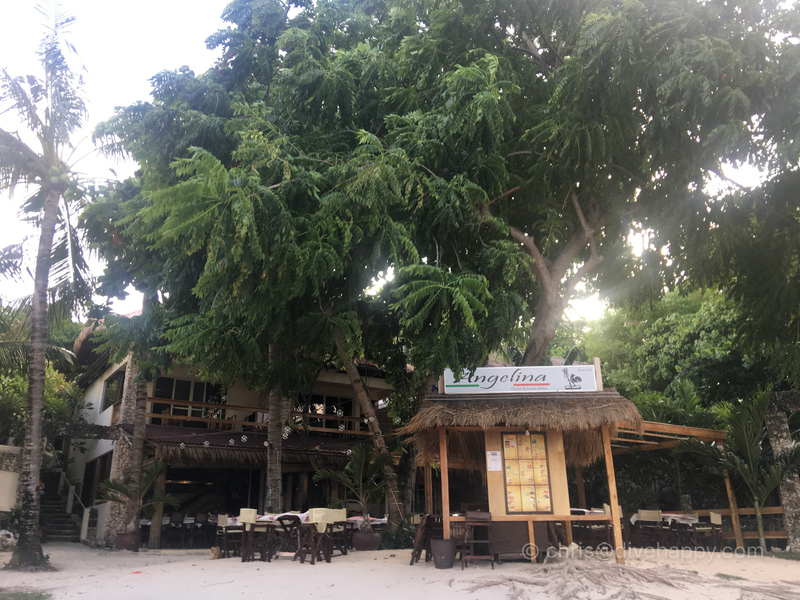 It’s a a few steps away from Angelina restaurant, Tepanee resort and the beautiful, cliff-top Amihan restaurant – be sure to visit for at least drinks to enjoy the view and the vibe. The photos of the rooms at Kokays Maldito on Booking.com are accurate of what you get; it’s a solid mid-range resort with clean, comfortable en-suite rooms and pleasant staff. The restaurant food is not so great – I preferred to eat at Angelina or Amihan in the evenings. Kokays’ location is at the quiet end of the beach – as you go further along there’s lots of local village houses and boats pulled up on the shore – it’s very much a working beach. If you want something more high end, Tepanee resort is worth checking out especially as Amihan restaurant is part of the complex. I did not explore much of Malapascua on land beyond strolling to the other nearby Bounty Beach on the eastern side of the island. This is another long stretch of sand with numerous resorts and bars facing out over the beach. Further up the island on the northern coast there is Langob Beach and a couple of smaller coves like Thresher Cove. The island is so small you could walk end to end within 30 minutes, but the great concentration of places is in the south. It’s worth noting that as both Logon and Bounty Beaches are working beaches, with lots of boats and boating paraphenalia scattered about, they are not ideal for sunbathing or for swimming in the water – there’s a lot of sea grass in the shallows. If you are travelling with non-divers it’s worth bearing that in mind. Who To Dive With On Malapascua? There are numerous dive shops on Malapascua – probably too many. I dived with Dive Society simply as they were attached to Kokays Maldito resort. Our dive guide Jordz was excellent – an great critter spotter, helpful with setting up and generally looking after people and good company during surface intervals. The staff in the actual dive shop were not so helpful – they didn’t volunteer much information about pricing, packages, and what was interesting about each of the main dive sites. The diving was from a typical banca if there were more than four of us – otherwise, from a small tender with sun roof and outboard motor. The dive shop was very quiet, with just my dive buddies Alex and Pierrick and a group of Chinese divers there besides myself for the whole week. Veteran dive operators on Malapascua include Thresher Shark Divers and Malapascua Exotic Island Dive Resort. There is no dedicated Malapascua liveaboard, but there are several liveaboards that stop at Malapascua as part of a Visayas liveaboard itinerary. Visayas refers to the central region of the Philippines and a liveaboard will typically take in Malapascua, Apo Island and Dumaguete, Sogod Bay, Bohol and Cabilao among other dive areas within a 7 day trip. You’d typically spend a day in each area – a great way get a taste and decide where to come back for longer stays. 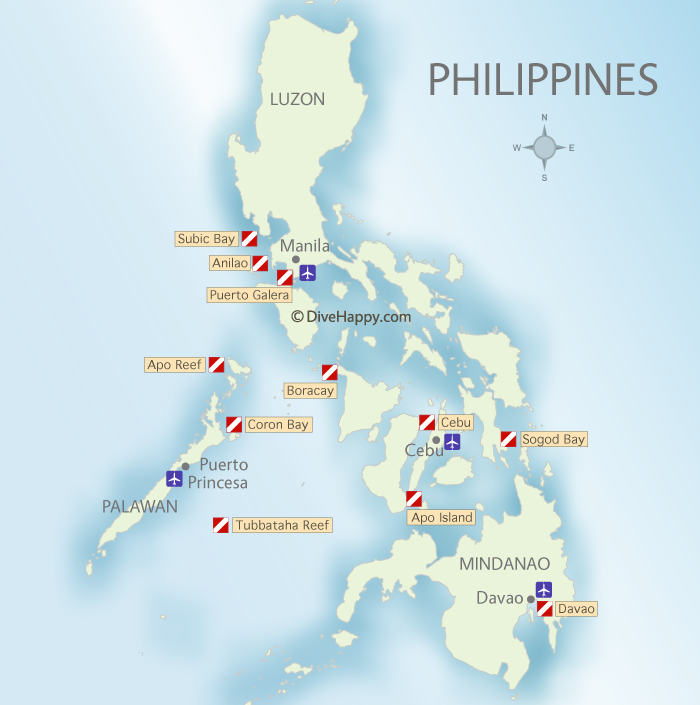 There are several Visayas liveaboards that operate during July to March each year. (During April to June each year most Philippines liveaboards go to Tubbataha Reef for the 3 month season where the Reef is accessible). Where is Malapascua located in the Philippines? Malapascua is located in the central Visayas region. The nearest airport is Mactan Cebu airport, which was massively upgraded in 2018. You can fly direct to Cebu from Singapore with Silk Air and from Bangkok with Philippine Airlines. Check Skyscanner to compare prices and timings for different airlines. If you can, avoid having to transit at Manila Airport. The quickest way is to book a private transfer through your resort (around 4200 Philippine pesos) from Cebu Mactan Airport to your Malapascua resort. It’s a 3 hour drive from Cebu airport to Maya Port. Then it’s a 20 minute crossing from Maya Port direct to resort on one of the local banca boats which has been requisitioned just for your group. You can simply book your Malapascua resort on Booking.com and then contact them via Booking to arrange the transfer. Alternatively, if you have time to spare, you can get a taxi to Cebu Northern Bus Terminal and catch a public bus to Maya Port. Once at Maya Port you can ask for the next boat departing to Malapascua – they don’t go until they’re full. You can also book a private transfer from Cebu Airport to Maya Port on 12Go, but you would still have to find your own boat. Before you depart Cebu, be sure to bring lots of Philippine Pesos with you as there are no ATM machines on Malapascua island. You can probably use a Visa / MasterCard credit card if you’re staying at a resort and also to pay the dive shop for all your diving costs, but be sure to check ahead. You’ll need cash to pay your driver getting to and from Malapascua as well as for meals and drinks on the island outside of where you’re staying and also for tipping at the end of your trip. ATM machines in the Philippines have relatively low maximum withdrawal limits – around 10000 PHP per day. (approx 200 USD per day). If you need more cash than that, you might want to plan a trip to HSBC Bank in Cebu City which allows withdrawals of up to 40000 PHP. The ATM machines are open 24 hours in a separate room to the left of the main entrance of the bank. The HSBC bank is located on C. Rosales Avenue, opposite the giant Ayala Mall. 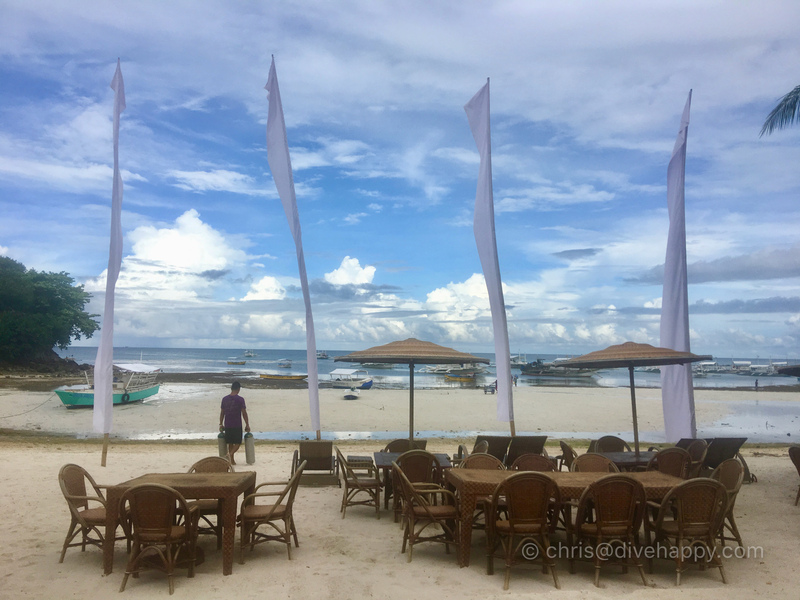 How much time should I spend in Malapascua? Come for the thresher sharks, stay for the macro and relaxed beach vibe. The abundance of macro plus excursions to Gato Island and the thresher sharks would easily occupy 5 days no problem – allow a day either side for transfer to and from Cebu airport and you have a solid week’s vacation. The thresher sharks are definitely a “more than once” dive too – despite the early morning wake-up, it’s likely you’ll want to do it several times. World Nomads provide travel insurance if you’re travelling in the Philippines that covers you both on land during travels to and from Malapascua and also while diving and on dive boats. Their insurance policy provides coverage for certified divers who don’t go below 40 meters and are diving with qualified guides or instructors. You can purchase insurance coverage on a per trip basis and extend it easily online if you decide to keep travelling. World Nomads are recommended by Lonely Planet and National Geographic among others. Get an insurance quote now. Is Malapascua safe for travelers? Yes, Malapascua is safe. The island has a small permanent population of couple thousand people and a plethora of dive shops and accommodation, mainly aimed at budget travellers with several more high end places opening in recent years. The nearest hyperbaric chamber is in Cebu City. As ever, make sure you have travel and dive insurance. 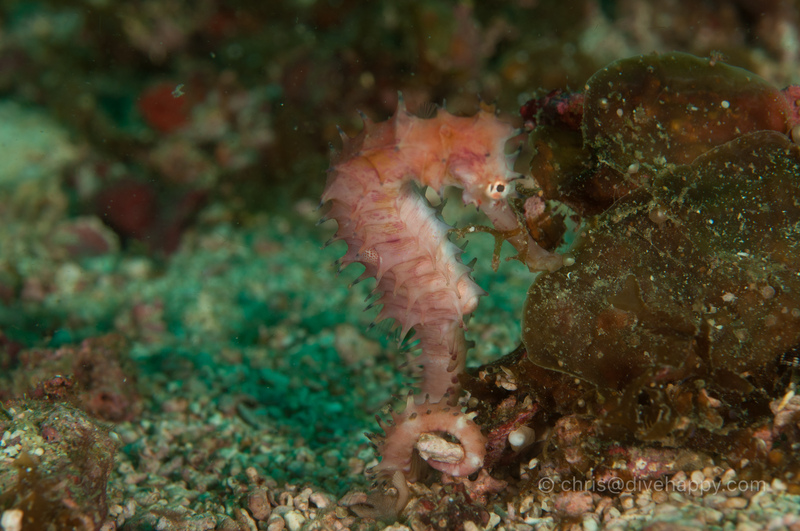 What should I pack for a dive trip to Malapascua? See the Divehappy Liveaboard Packing List to help you remember to bring everything you need for your scuba trip – it’s pretty much the same whether you’re on a boat or based on land. What topside things are there to do at Malapascua? Malapascua is a very small island – you could walk the length of it in less than a couple of hours. Besides hanging out at the resorts, bars and restaurants scattered on the two main southern beaches – Logon and Bounty Beach – and, to a lesser extent, the northern beaches, there’s not much else to do. 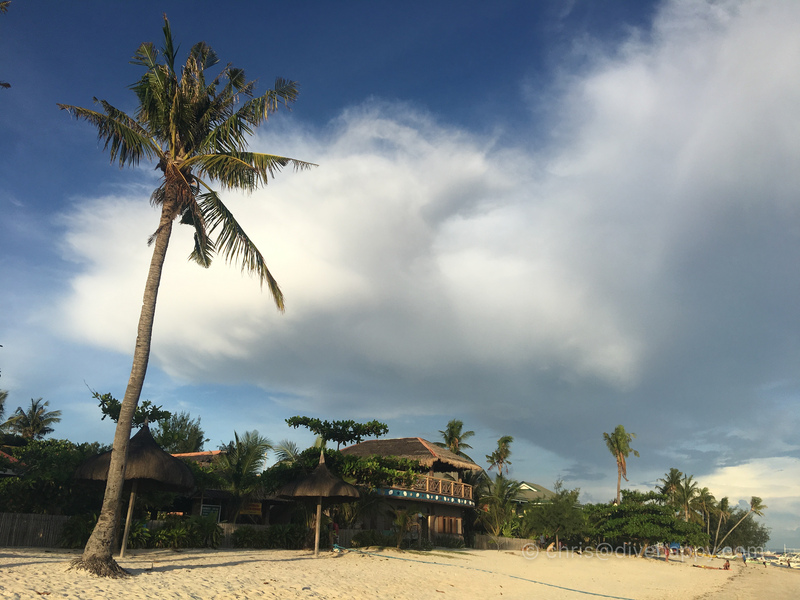 The beaches are in quite good condition for working beaches (ie there are a lot of boats constantly coming and going and also anchored) – certainly very pleasant for sundowners and evening dinner. Stand out places to eat include Angelina’s and almost next door to it Amihan, which is a pretty magical spot up a small hill with views over the bay and some gorgeous architecture. 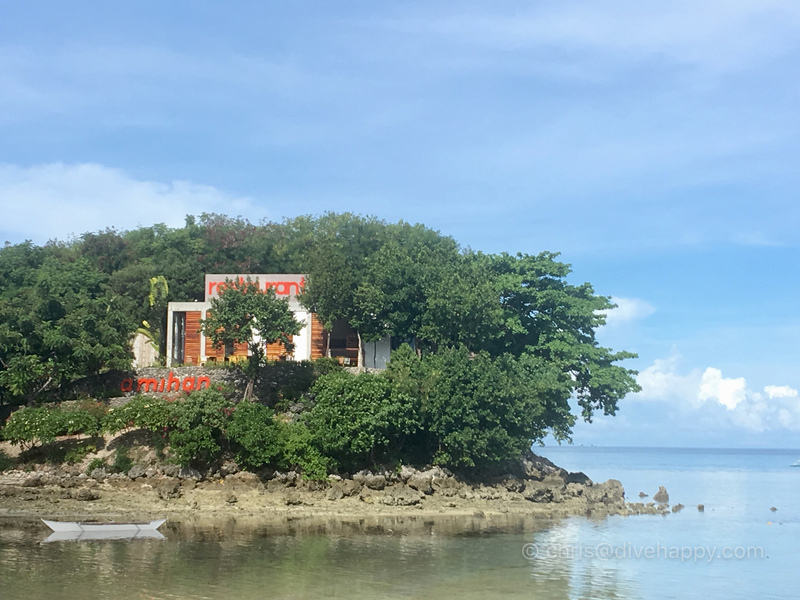 Check out TripAdvisor for other recommended places to eat on Malapascua.